Cn63. Second darkest dark dark red, 50% opaque. taste of dark plums, lovely fruit. Great balance and texture. Middle weight. Very balanced with smooth red fruit on the palate and very long. Excellent. I voted this third best of the night. Although slightly light and drying out, a very elegant wine. 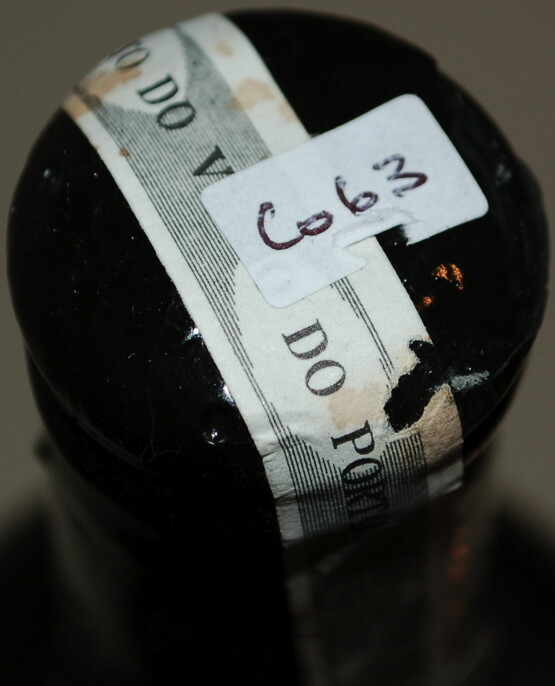 A dark cola color with young berries on the nose. Young soft fruit dominate the palate, elegant yet profound at the same time. Fresh fruit and full bodied with a long seamless transition and finish. Just a lovely bottle and a real treat. This just rocked. blackish, dark red colour; deep fruit nose after black berries and elder berries; fruity black currant tart, a bit one dimensional; good length, full bodied; good complexity; really great port! Deep red, rich in appearance; 80% opaque. Dusty cherries on the nose, lifted by bright menthol. Rich and thick in texture with big flavours on the palate showing multiple layers of flavour. Great complexity, perfect balance and even some tannins still in the mix. Long, sweet finish full of flavour and which morphs from one phase to another. Absolutely wonderful. 94/100. Drunk 11-Oct-13. Decanted 7½ hours.